How Will Sediment Diversions Affect Coastal Environments in Louisiana? In the “Answering 10 Fundamental Questions about the Mississippi River Delta” report, scientists clearly demonstrated that sediment diversions are the most effective tool to build and sustain land into the future. What have we learned since then? Beyond how a sediment diversion is constructed, its impact and effectiveness lie in how you operate it once built. 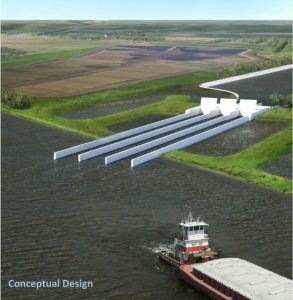 Rendering of what a future sediment diversion may look like. Credit: CPRA. The Mississippi River built our coastal landscape, and it is the only thing that can truly sustain our coast for future generations. But when and how we utilize the sediment, fresh water and nutrients in the river will determine the effects on the coastal environment, including water quality, salinity, vegetation, and fish and wildlife species. A recent USGS study concluded that large-scale river diversions, a cornerstone of the Coastal Master Plan, can greatly affect water quality, including salinity, turbidity and nutrients, throughout the estuary, resulting in “dramatic impacts on oyster production.” The authors utilized operation strategies for their study that were based on the 2012 Coastal Master Plan analysis. However, since 2012, we have learned a great deal on how operation strategies used in planning and modeling, such as in the referenced study, can be completely unrealistic for real world operations. Therefore, the predicted outcomes are unrealistic and, more often than not, overestimate the detrimental impacts to the coastal environment. To address this concern, the Sediment Diversion Operations Working Group was formed to help define more realistic operation strategies. The group, comprised of 12 Louisiana-based researchers with decades of experience working in coastal Louisiana, came together to discuss how to maximize land-building through a sediment diversion while considering a wide variety of factors including water movement, water quality, vegetation, oysters and shellfish, finfish, wildlife species, natural resource economics, and the communities that live, work and play on the coast. An additional 42 experts participated in the 8 month long process. Initial operation strategies will differ from long-term operation strategies: A sediment diversion cannot be operated at full capacity on Day 1. Gradually opening the diversion over time (an estimated 5-10 years) will facilitate the development of a distributary channel network, reduce the risk of flooding to communities, limit erosion of adjacent marshes, reduce the shock to marsh grasses and fish and wildlife species and allow them time to adjust over time around the new conditions. Use high river flows and sediment loads of the river strategically: Pulsed diversion operation mimics the natural flood cycle of the Mississippi River. Pulsed operations should focus on winter peaks, the first peak of the water year which carries the largest concentration of sediment, the rising limb of the peak which maximizes sediment while limiting freshwater, and peaks below 600,000 cubic feet per second (cfs) to capture suspended sediment loads essential to sustaining marshes. Pulsed operation strategy focusing on winter peaks and rising limb of spring peaks. Note: Although the diversion is depicted as open 100% or completely closed, each opening could happen gradually over time. Work with the geology of the receiving basin to build land: Any sediment that comes out of the diversion should be captured in the basin. A sediment retention target and strategically-placed landscape features can accelerate the land-building process. 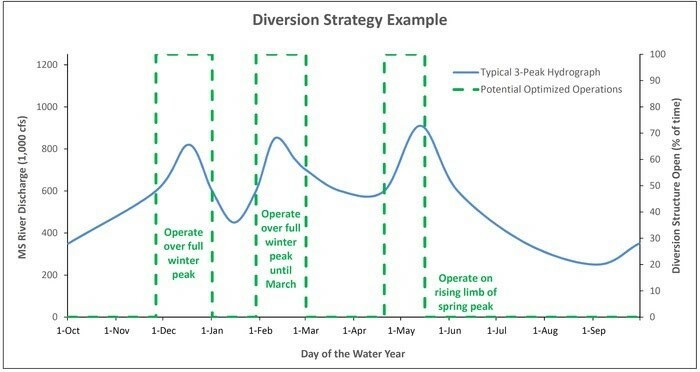 Maintain and improve water quality and wetland health: Winter operations and gradually shutting down the diversion can increase nutrient uptake and overall water quality in the basin. Adequate dry periods during the growing season can ensure vegetation is not unnecessarily lost to flooding. In addition, maintaining as much intermediate and brackish marsh as possible will reduce the risk of episodic loss of freshwater vegetation from droughts or rising sea levels. Balance the needs of fish and wildlife species: Winter operations will reduce or eliminate effects on fish and shellfish species, specifically during the initial operations. Spring and summer operations will require an intricate and balanced approach that considers the life cycle needs of indicator species. Ultimately, we want to ensure we maintain an abundant and productive ecosystem for fish and wildlife species. Analyze potential effects to communities and industries and clearly communicate them: Operation plans should include thorough, transparent and easy to digest analysis on the potential effects to communities and user groups, such as the fishing and navigation industries. Two-way dialogue with individuals that could be affected by diversion operations is necessary for the most successful outcomes. Negotiations should not occur over how to operate the diversion, instead on how to manage and deal with any predicted and unforeseen effects. Monitor before and after construction, and make the data publicly available: A robust, ongoing monitoring program should be developed to measure and understand conditions before, during and after sediment diversion construction and operation. Lessons learned should be incorporated into ongoing operation strategies. Define a clear governance structure supported by federal, state and local government: A formal governing structure should be developed to determine the roles and responsibilities of all parties and the decision-making process in diversion operations. Advisory councils should provide formal input, and technical and scientific (including social sciences) committees should be formed to provide unbiased analysis of the monitoring data and recommend modifications to the operation plan or adaptive management strategies. This is part 4 of our ongoing series where our experts will answer 10 fundamental questions with new and updated information, so that reasonable and scientifically-sound decisions can be made about the long-term sustainability of the delta and surrounding ecosystems. View an introduction to this series as well as posts on sediment, and vegetation.